PechaKucha Night İstanbul Vol. 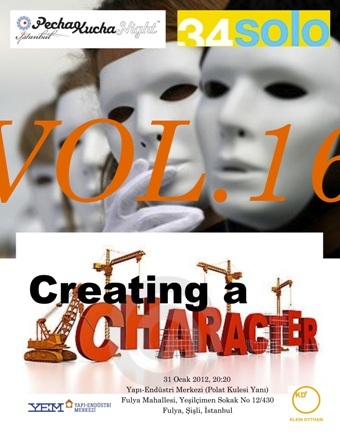 16 will take place at The Building Information Centre (YEM) on January 31st, 2013. In this first event of the year, we would like to give the ground to creatives from all walks to present around ‘Creating a Character’. Tunc Topcuoglu, designer from El Turco Digital will start the Night as his virtual pop star character named “Kurak But”. Following him, Director Emre Koyuncuoglu will analyze Hedda Gabler’s complicated soul, after staging the play at Istanbul City Theater. If you have a second life as a digital character what could happen to you? Burak Aydogan, founder of Tekjeton, will take the ground next to open up his character in World of Warcraft. Directors are the ones who revive the characters written in scripts on screen. Aylin Unsal, director of the movie, “The Wind”, will show us how. ‘Sir, could you make a character out of me?‘ You could be the lucky one. Baris Atiker, Assistant Professor of Graphic Design, Beykent University might choose you as his next character. This entry was posted in News, Pecha Kucha and tagged creating a character, pechakucha night istanbul vol.16. Bookmark the permalink.